There are many diverse places to visit in Peru, so instead of flying - and seeing nothing of the country - we decided to take the PeruHop bus through southern Peru from Lima to La Paz in Bolivia. To experience more of the Peru landscape and tourist attractions. Arequipa Peru, also known as the “White City”, is the second largest city in Peru and full of interesting history. Situated in the central area at an altitude of 2 400 metres it has pleasant year round weather, beautiful old buildings and is a central hub between the ocean desert and the tropical Amazon. Instead of flying (and seeing nothing of the country) we decided to take the PeruHop bus through southern Peru from Lima into La Paz Bolivia. After making all the pickups we left Lima on a mild and misty morning. As we drove through areas of Miraflores and Barranco our Peru Hop guide for this trip, Walter, told us stories of some of the history of Peru. With our second visit to Peru we decided to enjoy some of the Peru tourist attractions in southern Peru. A month earlier we’d done the trip to Machu Picchu via Cusco and Lima and realised that Peru had many other places to visit. Our trip from the village of Vilcabamba in southern Ecuador to Piura in northern Peru was via the city of Loja. We opted to take a taxi rather than the bus from Vilcabamba to Loja. It was early in the morning and misty in patches. The taxi driver drove “rápido”. In sections the roads are potholed with broken rough surfaces resulting in much braking and swerving. The taxis here are all rugged double cabs ... which are probably the one vehicle that can survive the road conditions! No-see-ums are unknown by their scientific name of Ceratopogonidae ... and it's no wonder with a name like that! But they are known all over the world by names like - biting midges - midgies in Scotland - no-see-ums - "sand flies" - punkies in the Americas - "sand flies" in Australia and "purruja" in Ecuador. The Lake Titicaca Peru overnight stay excursion includes visiting the Uros Floating Islands, Taquile Island and spending the night with a local family on Amantani Island. ​The journey starts from Puno which is one of the stops on the PeruHop bus route. 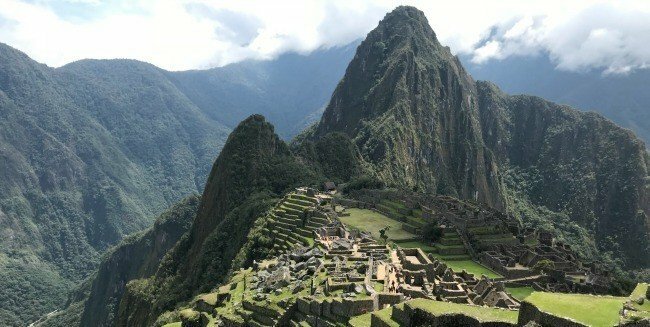 I took on walking the Inca Trail ... the iconic 4 day 3 night hike ... a month before my 70th birthday. It has a number of physical challenges but acclimatization, or acclimating, is very important.